The ERS Grooving Saw for Engineered Flooring has an 8’ width capacity for the feeding of 4 x 8 panels to groove along the width of the panel. The manufacture of engineered flooring requires multiple specialized processes to ensure its quality. One such process is the need to groove the underside of the flooring with consistent grooves across the product width to allow the regulation of humidity in the product which prevents stress and warping in the material. Doucet offers a solution especially designed with this process in mind. The ERS Grooving Saw for Engineered Flooring has an 8' width capacity for the feeding of 4 x 8 panels to groove along the width of the panel. Then, the panel goes through the RS-75 Panel Rip Saw for ripping in strips according to flooring width. Several features are incorporated to ensure proper grooving depth and easy change over. The saw arbor has a single adjustment system made for easy groove depth positioning. 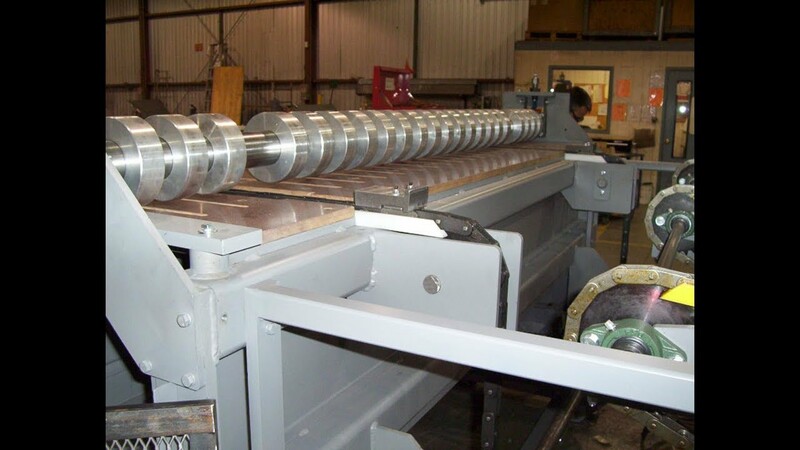 Feed chains with lugs are used to move the product through the ERS Grooving Saw keeping the panel perfectly square while eliminating variation in the groove depth caused by a feed roller system. An arbor with hold-down wheels located over the saws has been designed into the system to ensure consistent groove depth at very high tolerances. Under the work piece, a phenolic base plate is included for a no friction surface which eliminates drag against the panel during the sawing process. For easy change over, the saw arbor is designed to lower down and slide out from the side over a moving cart. While the saw arbor is out, a second saw arbor pre-set with new saw blades can be installed quickly to allow production to continue with little down time. The ERS Grooving Saw for Engineering Flooring has been engineered around grooving laminated flooring to ensure the best results for the application.